SINGAPORE (Sept 12): The financial performance of Asia’s family-owned businesses is far superior to their peers in terms of growth and profitability, finds a recent report published by the Credit Suisse Research Institute (CSRI). According to the Credit Suisse Family 1000 in 2018 report, family-owned businesses outperformed broader equity markets across every region and sector on a long-term basis, be it in terms of revenue growth or EBITDA margins, or cash flow returns and gearing. These findings applied to all Asian family businesses regardless of sector or size. The conclusion results from CSRI’s analysis of its database of over 1,000 family-owned publicly listed companies and their performance over a 10-year period, compared to the financial and share price performance of a control group comprising more than 7,000 non-family owned companies globally. In Singapore alone, 15 companies in the family-owned database. They were found to have generated an 8.9% annual average share price return since 2006, as opposed to the 4.8% average recorded by their non-family owned peers. Financials, consumer sectors and consumers discretionary made up the top three sectors in Singapore at 38%, 21% and 21% respectively. This trend in Singapore is in line with that of the 11 markets covered by CSRI in Asia ex-Japan, which continued to dominate and represent a 53% share of the universe with a total market capitalization of over US$4 trillion ($5.5 trillion). In total, family-owned companies based in Asia generated much higher returns than their global peers with an average revenue growth of 19.5% over the past decade, compared to 6.3% in North America and 7.4% in Europe. This was also so in terms of annual average total shareholder returns, where the Asian family-owned universe achieved 31.5% over the 10-year period compared to 16.6% and 9.2% achieved by its European and North American peers, respectively. Eugène Klerk, Head Analyst of Thematic Investments at Credit Suisse and the report’s lead author, believes the strong outperformance of Asia’s family-owned businesses is attributable to less reliance on external funding and higher investments in research and development (R&D). “Our research on a global scale also suggests family-owned companies with special voting right structures perform relatively in line with those with ordinary shares, contrary to the fears expressed by many investors,” says Klerk. It was also highlighted in the report that family-owned businesses in Asia tend to be much smaller and younger than their global peers, with a comparatively longer-term and more conservative focus. “Historical data for our family-owned companies also show stronger growth in gross investments. 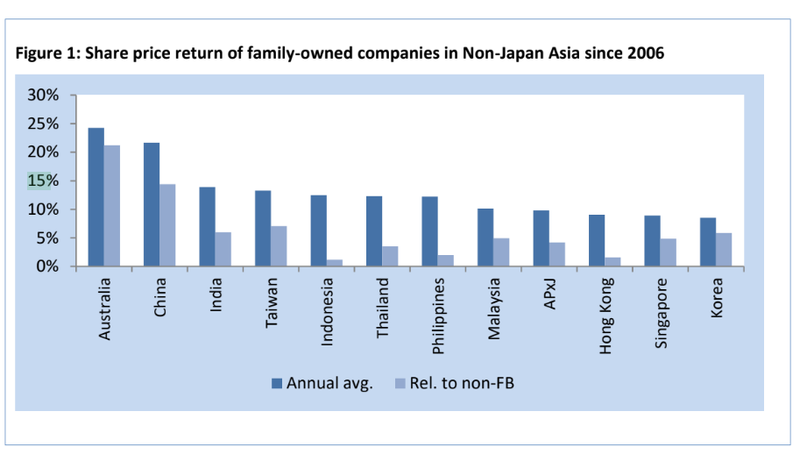 Given the younger age of family-owned companies in Non-Japan Asia, it is not surprising to us that their asset growth is also above the average for the other regions,” notes CSRI. “Having a longer-term investment focus provides companies with the flexibility to move away from the quarter-to-quarter earnings calendar and instead focus on through-cycle growth, margins and returns. This also allows for a smoother cash-flow profile, thereby lowering the need for external funding. In turn, all of this has supported the share price outperformance of family-owned companies since 2006,” it adds.